As much as 41,000 tons of edible food that is presently wasted, or roughly 68 million meals, could be diverted to hunger programs across three of the largest cities in the United States, according to an ambitious, first-of-its-kind study from the Natural Resources Defense Council (NRDC). The study, based in part on data provided by LeanPath, analyzed edible food currently entering the waste stream in New York City, Denver and Nashville, and estimated the additional infrastructure necessary to transfer, store and distribute this valuable food to those in need. 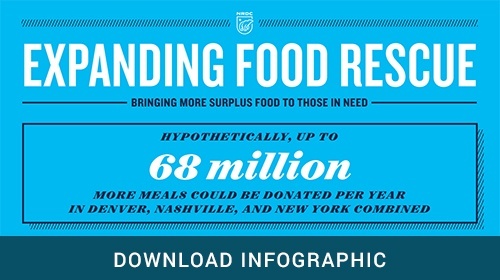 Food rescue efforts are accelerating in cities across the country, but unfortunately there is currently no consensus among municipal governments and foodservice organizations regarding how to accurately measure food rescue potential, the report states. As a result, officials face challenges in planning and budgeting, and food rescue programs are only developed incrementally, with limited shared and long-term vision among stakeholders. The NRDC study - and its advocacy of automated waste tracking solutions - hopes to drive this consensus. The study found that grocers represent the largest untapped food rescue potential -- 60 percent. Approximately 26 percent of untapped food rescue potential resides in the hospitality, healthcare, university and schools segments. The study also tallied the “Meal Gap” in each city -- the number of meals necessary to assist those in need, less the number of meals hunger programs currently provide -- and found the gap could be closed by nearly half in Denver and Nashville if edible food was better diverted from the waste stream. In New York City, 23 percent of the Meal Gap could be closed. As part of the study, the NRDC evaluated the investment required for Denver to capture the 4,232 tons of edible food the city currently wastes. Extrapolating from current food rescue expenses, they estimated operational costs of $6.2 million per year, with primary costs going to staffing, vehicles and storage. “Food rescue does not come for free,” the study concludes.